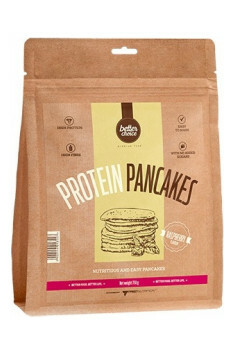 PROTEIN PANCAKES – a delicious oatmeal protein pancake mix. It contains whole protein from whey protein concentrate (WPC), milk powder and eggs. Protein plays a fundamental role in muscle growth and keeps your bones healthy. High protein and dietary fibre content. No added sugar. Contains natural sugar. Mix 75g (six scoops) in 100 ml of water. Shake strongly until uniform consistency. Fry on both sides in low amount of oil. The product makes it possible to prepare a fast, wholesome and filling meal. It will prove perfect when you have no time, ideas or ingredients to prepare a healthy meal, protecting you from the temptation to choose an unhealthy snack. The pancakes can be served with toppings of your choice, depending on your preference and energy expenditure, for example: fruit, peanut butter, a calorie-free sauce, or jelly. Oatmeal (29%), oat flour (22%), whey protein concentrate (20%), whole milk powder (15%), coca powder for chocolate flavor (4%), egg white powder (5%), egg yolk powder (3%), raising agents - sodium carbonate, ammonium carbonate; thickener - xanthan gum; salt, sweetener - sucralose.